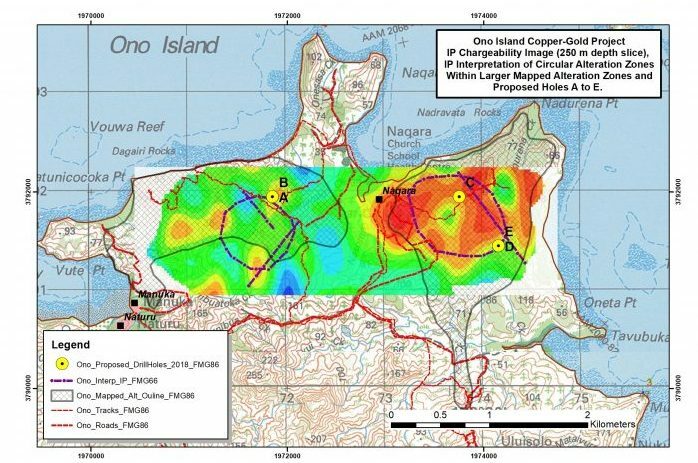 Special Prospecting Licence (SPL) 1451 covers 3,028 ha and is located in the southern part of Fiji on Ono Island. 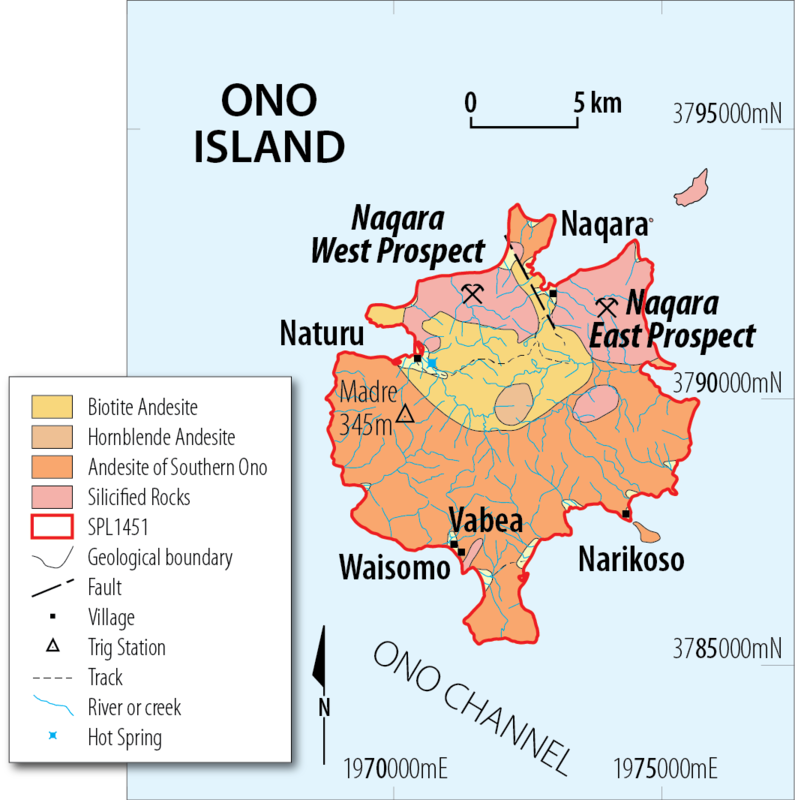 Ono Island was formed by volcanic eruptive activity approximately 4mya at the eastern end of the Kadavu Island chain, approximately 80 kilometres south of Suva, Fiji’s capital. High-sulphidation epithermal gold-silver mineralisation is the primary target based on interpretation of results recorded by previous explorers in the area, who reported anomalous stream sediment geochemistry and mapped surface exposures of hydrothermal rock alteration and silicification. Although not outcropping, the gold mineralisation is expected to lie at depth below two zones anomalous in gold, copper, mercury, antimony, molybdenum and arsenic soil geochemistry. 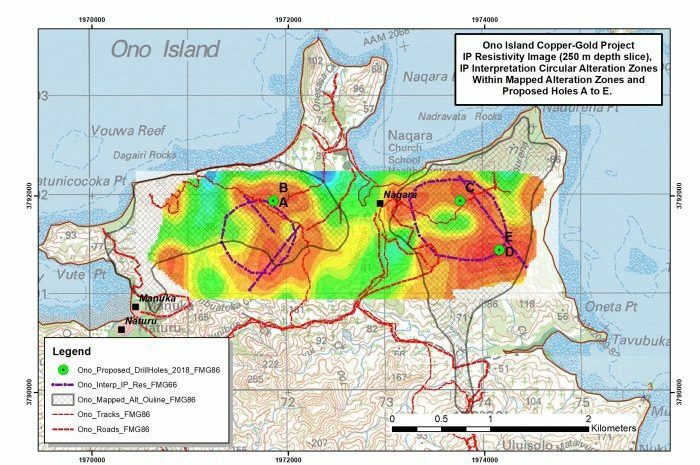 In October 2016 an offset pole-dipole IP survey was successfully completed on two adjacent high sulphidation epithermal gold prospects on the northern part of Ono Island, known as Naqara East and Naqara West (see ASX release dated 31 October 2016). These had previously been covered by soil sampling in 2013 and geological mapping campaigns in 2014 that identified areas of intense argillic alteration and zones of silicification and anomalous geochemistry, proximal to the northern rim of a volcanic caldera (Figure 2). 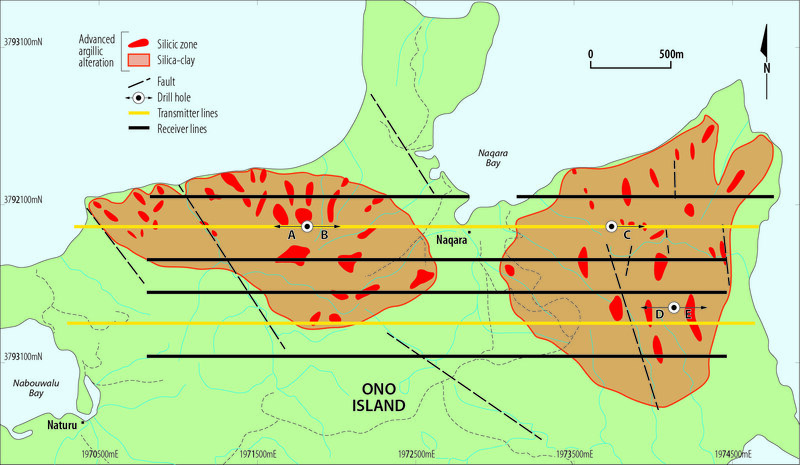 Figure 2 – Naqara East and West Prospects on Ono Island showing the extent of hydrothermal alteration and the IP survey lines. Proposed drill hole locations (A to E) are based on the IP results and surface geology. The offset pole-dipole IP survey involved four arrays, two over each prospect (Figure 2). Transmitter electrodes were placed along a central cut line at 100m intervals with three to four additional electrodes at the end of each receiver line for totals of between 31 and 32 points per array (gold coloured lines on Figure 2). Receiver electrodes were placed at 100m intervals along the two survey lines either side of the transmitter line (34 points). Two 32 channel IP receivers were used to take 3 to 4 readings at each electrode. The two arrays on the eastern Naqara prospect produced coherent data showing a NNW trending linear resistivity anomaly that was evident nearer surface and coincident with a distinct chargeability anomaly at increasing depth. The relationship between resistivity and chargeability is poor near surface at Naqara West, but there are indications of increasing chargeability with depth, although the response is not as persistent nor as strong as at the Naqara East prospect. In part this may be due to the chargeability response (particularly at the Naqara West prospect) being impacted by the proximity and incursion of seawater and the rugged and more deeply incised terrain in the west. This contributed to “low earth resistivities” particularly for deeper readings (below 300m to 400m). An exploration diamond drilling program is now underway that will test for economic gold-silver mineralisation on Naqara East and Naqara West (see ASX announcement dated 6 March 2018). The targeting of these drill holes is based on the combined results of the ionic leach soil sampling, geological and alteration mapping and the IP geophysical survey. 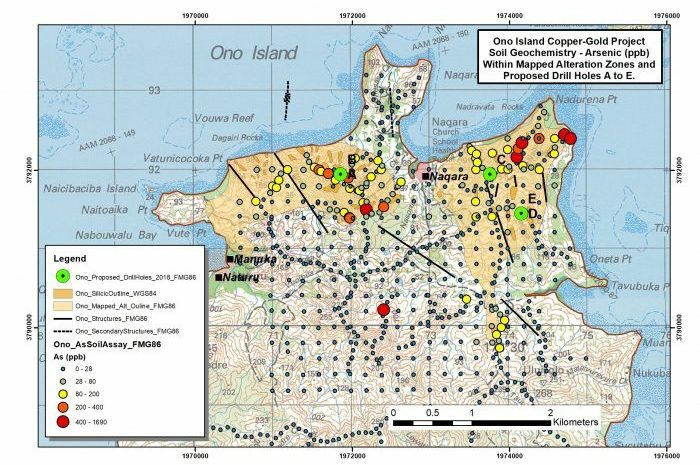 Figure 3 is a map showing a compilation of the geological alteration mapping and the arsenic analytical results from the ionic leach soil sampling grid as well as the approximately location so the first of 5 x 500m drill holes. Diamond drilling will produce HQ size core samples that will be analysed for gold, silver and other metals. The program is planned for initially 5 holes on the two prospects with a further 5 holes should results warrant. Selection of the later hole locations will be based on the results from the first drilling phase. Initial analytical results from core samples are expected to be received by Dome in late March 2018. Figure 3 – Plan showing the alteration zones and ionic leach soil sampling results on the Naqara East and Naqara West prospects. Figure 5 – Plan showing the IP Conductivity data slice at 250m depth with target areas for drilling outlined by purple coloured dashed circles. Approximate locations of the first 5 drill holes labelled A to E are also indicated.